So I finally ventured out into the frozen snowy landscape that is Perth and well, Scotland in general. As I’ve been working sleepovers and nighshifts I have seen some beautiful morning mists and evening sunsets, but as working not had the camera or time to take a photo. Today, though, the sun was out and I had the day off. The temperature was somewhere closer to zero than the more common -8 of recent weeks, so it was on with boots and winter jacket over the usual 3 layers and out into the snow. Though the streets have been gritted and ploughed at last some of the pavements were still a little interesting to walk so decided not to go far. Fortunately the South Inch park is just down the road, and it was beautiful. Ok so the snow went passed my ankles and the paths completely hidden and the duck pond could only be distinguished by the benches around the edges, but still a lovely sight with the sun beaming down. 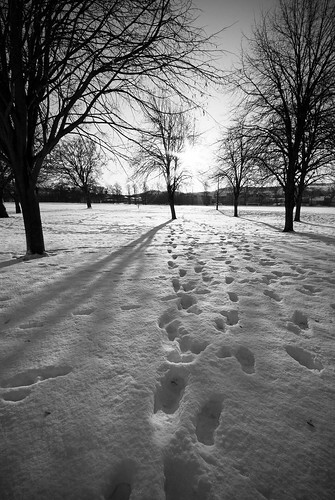 Must admit was reveling in the lovely cold shadows and open expanse of white. Then I stepped into the shadows and wow it was cold! So I decided that after about 30mins it was time to go home and warm up again. After all I couldn’t play the crazy golf as couldn’t find the course in the snow let alone the holes! Then this evening I thought I would Blog my little trip and found that Ian had been playing with the site again and I had a real fight trying to get my little photo at the top of the post. It would be there on the draft but when I posted it, it just disappeared! Some kind of insight would of been nice. Thanks for that Ian !!!!! Men ! Sigh!